Would you separate these trees? 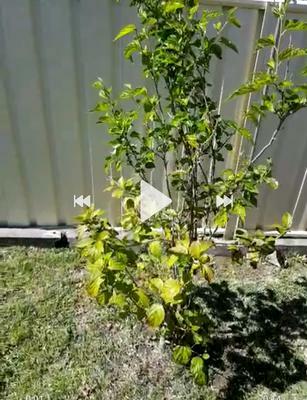 A few years back family members gave us several Hibiscus trees which we planted in a row. One had several branches right off the base but we thought nothing of it. Part of the tree lost leaves but it came back and this year I noticed it's got fruit! It's a Mulberry tree! How can that be? Well when I got down and examined the base you can see it's actually two different trees! And now you can tell they are different trees. So it's a pink Hibiscus and a Mulberry tree growing in the same spot. We don't know whether to try to separate them or leave them. Will one kill off the other? Can they be separated at this stage without killing either one? Thanks. Comments for Would you separate these trees? In time, the mulberry tree will most likely grow bigger than the hibiscus and smother it. 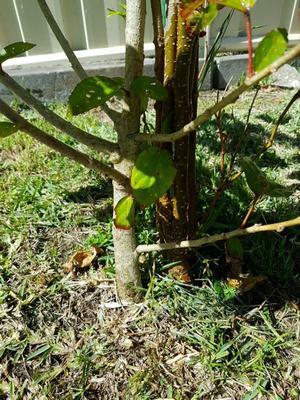 If you like the hibiscus, I would dig them both out and separate them, planting the hibiscus back where it's supposed to be, and giving the mulberry tree a lot more room to reach its full potential. The risk would be that this entails some major surgery, but as they're both still fairly young, the roots will probably be easy to disentangle from each other and they will quickly reestablish new roots. Timing will be important - the best time to dig up trees and shrubs without damaging them is when they're dormant, just coming out of winter before they get leaves. The aftercare will be just as important - water them as if they're newly planted - which they will be.